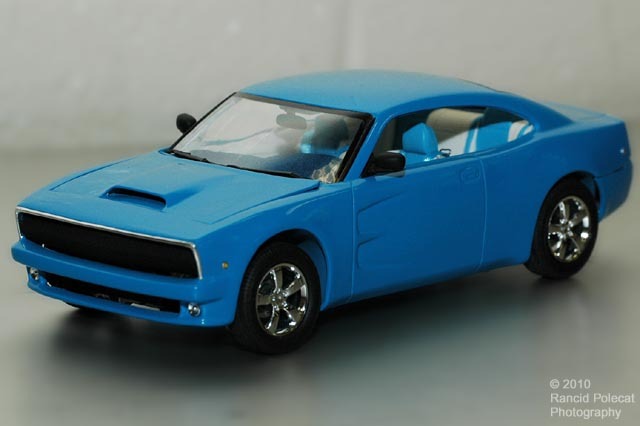 Like many of us, Ron Dreschler was somewhat disappointed in Dodge when they released the current version of the Charger. Being a MOPAR maniac from way back, he just KNOWS that Chargers have two doors, not four. Not ever. When Lindberg released their kit of the new Charger, Ron got his opportunity to show Chrysler how they should have done it. Along with correcting the number of doors, Ron converted the roof to a hardtop configuration, eliminating the door posts and re-contoured the side window openings accordingly. He then incorporated key styling elements from the Charger's most definitive era, 1968-69. Here you can see the door moldings and 1968 grille styling along with the small, round 1968 side marker lights.